Red '1' was flown by veteran of the Spanish Civil War, later the ace and Knight's Cross recipient Hptm. Trautloft, and was an example of the oldest camouflage scheme used on the E-1. The upper surfaces are in the standard irregular patterns of two dark greens, RLM 70/71. The sharp demarcation between these and the lower RLM65 was very low on the fuselage, Upper surface colors also curled under the leading edges of the wings to extend to the bottom surfaces. Inconsistent upper and lower color demarcation appears on the engine cowling. The striking red markings reveal service with 2. Staffel and the shoe emblem identifies the planes connection to I./JG 77, which descended from IV./JG 132. It was with this aircraft that Hptm. Trautloft commanded his Staffel during the Polish campaign. "Èervená 1" veterána španìlské obèanské války, pozdìjšího stíhacího esa (58 vítìzství), nositele Rytíøského køíže a rebela Hptm. Trautlofta je pøíkladem nejstaršího kamuflážního schématu používaného na Bf 109E-1. Horní plochy jsou tvoøeny dvìma odstíny tmavì zelené barvy (RLM 70/71) se standardizovanými lámanými hranicemi. Ostré rozrhaní mezi horními a spodními plochami (RLM 65) bylo velmi nízko. Svrchní barvy byly navíc pøetaženy pøes nábìžnou hranu až na èást spodních ploch. Neobvyklé øešení pøechodu svrchních a spodních ploch se objevuje na krytu motoru. Pestré èervené doplòky znaèí pøíslušnost ke 2. Staffel a rozbitá bota byla znakem I./JG 77, který jednotka pøevzala od IV./JG 132. Se zobrazeným strojem vedl Hptm. Trautloft svou Staffel bìhem polské kampanì. JG77 was formed in May 1939 with I, II gruppes. 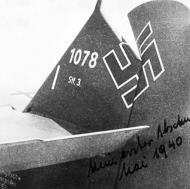 III/JG77 was formed on 5 July 1940 in Trondheim from the II(J)/JG186. I/ JG77 was reorganized on 21 November 1940 into IV./JG51 and a new I/JG77 re-formed. In April 1942 1 Staffel and became the defence unit for the Poesti oil fields at Mizil. (This staffel became in August 1942 1./JG4.) JG77 took part in the Invasion of Poland on 1 September 1939, and was attached to Luftflotte 3. The first Jagdwaffe victories in the West occurred on 4 September 1939, when II/JG77 shot down 2 RAF bombers over the North Sea. Fliegerkorps X(under Luftflotte 5) in operations against Britain from bases in Norway. While the rest of JG77 was based in France during the Battle of Britain, III/JG77 remained deployed around Berlin. 7 & 8 Staffel was transferred to Dinan, France, in late 1940. In May 1941, II and I2./JG77 were used in support of the invasion of Greece and the paratroop assault on Crete. Elements of JG77 also flew fighter-bomber anti-shipping missions, sinking the Royal Navy cruiser HMS Fiji and severely damaging the battleship HMS Warspite. Following the operations in Crete, JG77 was withdrawn to Romania in order to prepare for Operation Barbarossa. During this time, III Gruppe was in the process of converting to the new Bf. 109-F, a process that would be completed shortly after the attack on the Soviet Union began. As Operation Barbarossa, the invasion of the Soviet Union, started on 22 June 1941 II. and III. Gruppe plus Stab supported the advance East as part of the Southern Front. In spring 1942, JG77 was involved in the heavy air battles over the Kerch Peninsula area in the Crimea. Hauptmann Gordon Gollob( 86 kills) was sent from the Test Centre at Rechlin to take over as Geschwaderkommodore, and Hauptmann Heinrich 'Pritzl' Bär (91 victories) was sent from IV./JG51 to command I./JG77. During May 1942, Bär and Gollob would dominate the air war over the Kerch area. The total victory tally of Jagdgeschwader 77 by 19 May was 2,011. Gollob became the first fighter pilot to claim 150 air victories in August 1942, and left JG77 soon after, being replaced by Major Joachim Müncheberg. I. Gruppe was reorganized into I. Gruppe Jagdgeschwader 5 in January 1942, and the entire JG77 (with a newly created I. Gruppe) was then transferred south to the Mediterranean area. During operations against Malta from June-Oct 1942, I/JG77, under the leadership of Hpt. Bär, claimed 99 aircraft shot down to add to the 900 claimed in Russia. Oblt. Freytag claimed 25 kills over Malta, Obfw. Walter Brandt claiming 14.
replacing Jagdgeschwader 27 in North Africa in October 1942. II/JG77 arrived in December 1942, with 1,300 victories claimed on the Eastern Front. The two gruppen had claimed between them a total of 775 Soviet aircraft in the last four months, with a quarter of these claimed by just four pilots(Setz, Hackl, Clausen and Reinert). JG77 saw extensive action against the Desert Air Force fighter-bombers, the unit's aces continuing to build their scores. During the Mareth offensive in Feb-March 1943, JG77 claimed 18 Kittyhawks on 26 February. Total Allied air superiority led to the various JG77 bases in Tunisia coming under constant air attack, large numbers of Bf 109's written off on the ground. After claiming a further 23 kills, Major Joachim Müncheberg was killed in action with USAAF Spitfires on 23 March. Even under increasingly difficult circumstances, the Geschwader did their upmost to protect the retreating Afrika Korps forces. Hpt. Bär claimed 61 victories during their African service (45 over Tunisia), while Oblt Ernst-Wilhelm Reinhardt of II/JG77 claimed another 51 kills. By the 20 April 1943, JG77 were the sole fighter presence in Northern Africa. The unit flew out on 8 May, withdrawing to Sicily, leaving most of their ground crews behind. The Wing had suffered heavy losses in the air and on the ground, while claiming 333 air kills in total in North Africa. During 1943 and 1944 JG77 was stationed on the Southern Front, mainly in the Balkans Sardinia and Italy, but also in Romania. On 24 April 1944 III/JG77 intercepted USAAF heavy bombers raiding Ploesti, losing Hpt. Emil Omert (70 kills) killed in action. By June 1944, just two gruppen of JG77 were the sole air defense left in Italy and the eastern Mediterranean. In 1945 JG77 was relocated to Germany itself to help with Reichsverteidigung (Defence of the Reich). In the last months of the war part of JG77 was employed against Soviet Air Force in Silesia. In this area on 7 March, 1945 Kommodore Major Erich Leie, a 118-kill ace, was killed in combat with Yak-9 fighters. "HMS Wryneck, destroyer". naval-history.net. Retrieved 18 January 2011. "Slamat Commemoration, 27 April 2011". krlmuseum.nl. Retrieved 18 January 2011. Preston, Antony (1971). 'V & W' Class Destroyers 1917-1945. London: Macdonald. OCLC 464542895. Raven, Alan; Roberts, John (1979). 'V' and 'W' Class Destroyers. Man o' War. 2. London: Arms & Armour. ISBN 0-85368-233-X.